Arturo Montiel Rojas (born October 15, 1943) is a Mexican politician affiliated with the Institutional Revolutionary Party (PRI). He was a governor of the State of México and a federal deputy. Montiel is the son of Gregorio Montiel Monroy and Delia Rojas García. He received bachelor's degrees in public administration and accountancy from the National Autonomous University of Mexico (UNAM) in 1970. He married Maude Versini Lancry in 2002, a French journalist 31 years younger than he was. They divorced in September 2007. As a politician, he was the mayor of Naucalpan and director of civil protection at the federal Ministry of the Interior. At the state level he was secretary of economic development and presided twice over the local branch of the Institutional Revolutionary Party (PRI). In 1999, during his gubernatorial campaign for the State of Mexico, he portrayed himself as a tough-on-crime candidate, using a series of radio spots in which he implied that criminals did not deserve human rights protection, saying "human rights are for humans, not for rats" ("rat" being common slang for "thief"). He won the election by simple majority and served from 1999 until 2005. On August 4, 2005, he was elected as candidate of Unidad Democrática, a political group challenging former PRI leader Roberto Madrazo for the party's candidacy for the 2006 presidential election. However, in a press conference held on October 20, he announced that he would no longer seek his party's nomination because of accusations leveled against his family in the media, including his ownership of several luxury apartments and mansions in Mexico and France. Among other businesses he granted construction of more than 5,000 homes in an ecologically preserved community in the municipality of Atizapán de Zaragoza, the Zona Esmeralda. These new communities, shopping malls and schools were constructed on what used to be green areas and forests. In 2013, Forbes magazine named Montiel as one of the 10 most corrupt Mexican politicians. Enrique Peña Nieto, the 57th president of Mexico, is Montiel's nephew. ^ Montalvo, Tania. "Los personajes polémicos cercanos a Peña Nieto". CNN México. CNN. Retrieved 2 September 2014. ^ Tobar, Hector (21 October 2005). "In Mexico, PRI's Montiel Ends His Presidential Bid". The Los Angeles Times. Retrieved 1 September 2014. ^ Estevez, Dolia. "The 10 Most Corrupt Mexicans Of 2013". Forbes. Retrieved 1 September 2014. ^ Imison, Paul. "The PRI and Loathing in Mexico City". CounterPunch. Retrieved 28 December 2012. The Ecological Green Party of Mexico is a green-conservative political party in Mexico. In the 2012 Legislative elections, the party took 34 seats in the Chamber of Deputies and nine seats in the Senate. During the 2012 Presidential election, PVEM supported Enrique Peña Nieto (EPN), the candidate from the Institutional Revolutionary Party (PRI), who was elected. In 2018, PVEM supported Todos por México Everyone for Mexico coalition, along with PRI and Panal. José Antonio Meade, the coalition's candidate, came in third in a four-way race, with 16.43% of the vote. Roberto Madrazo Pintado is a Mexican politician affiliated with the Institutional Revolutionary Party (PRI). He was the candidate of the alliance between his party and the Ecologist Green Party of Mexico (PVEM) in the 2006 Mexican presidential election. A gubernatorial election was held in the State of México on Sunday, 3 July 2005. Voters in Mexico's most populous state went to the polls to elect a governor to replace former incumbent Arturo Montiel Rojas of the Institutional Revolutionary Party (PRI). Enrique Peña Nieto, commonly referred to by his initials EPN, is a Mexican politician who served as the 57th President of Mexico from 2012 to 2018. A member of the PRI, he previously served as Governor of the State of Mexico from 2005 to 2011, local deputy from 2003 to 2004, and Secretary of Administration from 2000 to 2002. Miguel Ángel Osorio Chong is a Mexican politician who served as the Secretary of the Interior in the cabinet of Enrique Peña Nieto. He was Governor of Hidalgo until April 2011. Luis Videgaray Caso is a Mexican politician who served as the Secretary of Foreign Affairs from 2017 to 2018. Previously he was the Secretary of Finance and Public Credit, also in the cabinet of Enrique Peña Nieto, from 2012 to 2016. Prior to Peña Nieto's victory in the elections, Videgaray was General Coordinator of his campaign for the 2012 Mexican presidential election. On July 11, 2012, Peña Nieto announced Videgaray as the person in charge of promoting the economic reforms and the government agenda's related topics, and on September 4, he named Videgaray as co-head of the team that set policy direction for the new government that took office on December 1, 2012. 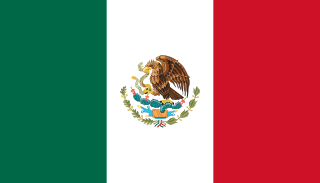 General elections were held in Mexico on Sunday, July 1, 2012. Yo Soy 132, commonly stylized as #YoSoy132, was a protest movement composed for the most part of Mexican university students from private and public universities, residents of Mexico, claiming supporters from about 50 cities around the world. It began as opposition to the Institutional Revolutionary Party (PRI) candidate Enrique Peña Nieto and the Mexican media's allegedly biased coverage of the 2012 general election. The name Yo Soy 132, Spanish for "I Am 132", originated in an expression of solidarity with the original 131 protest's initiators. The phrase drew inspiration from the Occupy movement and the Spanish 15-M movement. The protest movement was self-proclaimed as the "Mexican spring" by its first spokespersons, and called the "Mexican occupy movement" in the international press. Ernesto "El Pato" de Lucas Hopkins is a Mexican politician. He is a member of the Institutional Revolutionary Party. He was Federal Deputy during the LXI Legislature of the Mexican Congress under the principle of relative majority for the III Federal Electoral District of Sonora, which comprises the northern part of Hermosillo, the state capital. 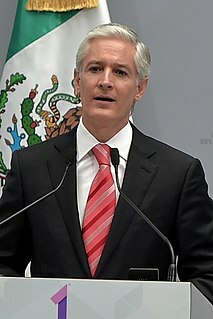 On 10 December 2012 he was appointed CEO of ProMéxico, the Federal Government body that coordinates strategies to strengthen Mexico’s participation in the international economy; supports the export process of companies established in Mexico and coordinates actions aimed at attracting foreign investment. On 20 April 2013 he was fired from this post, less than five months from taking over at this office, probably making him the first senior officer to be fired by President Enrique Peña Nieto. Corruption in Mexico has permeated several segments of society – political, economic, and social – and has greatly affected the country's legitimacy, transparency, accountability, and effectiveness. Many of these dimensions have evolved as a product of Mexico's legacy of elite, oligarchic consolidation of power and authoritarian rule. José Antonio Meade Kuribreña is a Mexican politician, economist, lawyer, and diplomat. He served as a cabinet minister under Presidents Felipe Calderón and Enrique Peña Nieto in a variety of portfolios, becoming the first Mexican official appointed to cabinet five times. He was the Institutional Revolutionary Party (PRI) candidate in the 2018 presidential election, where he placed third. The Atlacomulco Group is an alleged Mexican political organization made up of powerful political figures within the Institutional Revolutionary Party (PRI), who have denied its existence. The group is alleged to be based in Atlacomulco and to have been very influential in the politics of Mexico State and the federal government. However, the most influential people linked to the group, such as Isidro Fabela, Carlos Hank González and Arturo Montiel have denied its existence or refused to confirm its existence.The group was considered to be one of the pillars of the PRI. Alfredo del Mazo Maza is a Mexican politician affiliated to the Institutional Revolutionary Party (PRI) and was sworn as the current Governor of the State of Mexico. Members of del Mazo's family have collectively governed of the State of Mexico for 23 years, starting with his grandfather Alfredo del Mazo Vélez (1945-1951); then followed by his father Alfredo del Mazo González (1981-1986), his cousin Enrique Peña Nieto (2005-2011); with Arturo Montiel, connected to the family because of being Peña Nieto's uncle, the del Mazo family's rule extends to 29 years.